One of the first steps to planning a trip to any location is determining the gateways to your destination. This usually means finding the nearest airports to your destination so you know which flights to book for the trip. Among the airports on this list, this is the closest to Glacier National Park. Making your way to the national park can be complicated, but Glacier Park International makes everything a lot easier with the help of rental cars and shuttles that can take you from the airport to the park. The entire drive to the center would be approximately be an hour. This is an ideal starting point for Canadian visitors. Lethbridge Airport is just sitting across the border. But more than the Canadians, this gateway could be a more adventurous choice because of all the scenery you’ll be exposed to with the longer journey. Just be sure that you’re ready for the long haul by booking rental cars in advance. 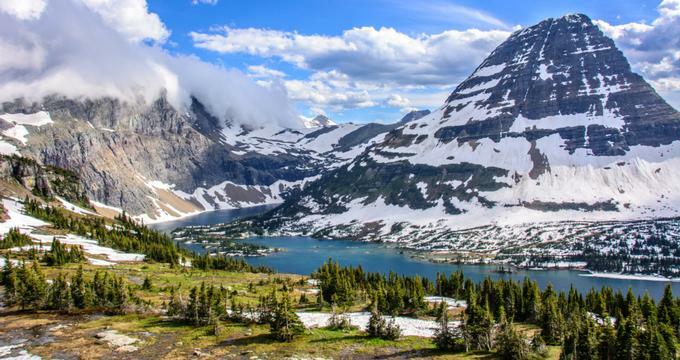 This one is roughly three hours away from Glacier National Park, so it’s a great alternative for some American travelers as well. Much like the Lethbridge alternative, this gateway will treat travelers to a scenic drive on the way to the destination. Glacier National Park is just northwest of Montana along the Canadian border. Southwest (29 miles) of the park is its closest city neighbor, Kalispell, followed by Missoula from the south (150 miles), and Great Falls from the southeast (200 miles). The quickest route to the park for cars is to take the U.S. 2 and U.S. 89. Access is mainly at both ends of the Going-to-the-Sun Road, namely the West Glacier and St. Mary. If you’re coming from the western boundary of the park, you can go in Polebridge and make your way to Bowman and Kintla lakes. You can also take the Camas Road to get to the Going-to-the-Sun Road. As for the east side trails, they’re meant primarily to be hiking trails that grant access to particular spots, although they don’t necessarily lead you to the center of the park. These trails are the East Glacier, Essex, Two Medicine, Many Glacier, and Cut Bank. You’ll want to get visitor entrance passes as well. These can be purchased at the West Glacier, Polebridge, Many Glacier, and St. Mary entrances. Unfortunately, the place is closed during the winter. Most of the Going-to-the-Sun Road is closed as well. You already know that you can get to the Park via plane. But you can also take the rail. There is a train by Amtrak’s Empire Builder that travels between Chicago to Seattle which stops at East Glacier between May to October and Essex and West Glacier all year round. - You can also approach the park’s visitor centers. They’re located at Logan Pass, Agpar, and St. Mary. Park information is also provided at Polebridge, Mary Glacier, and Two Medicine. If you’re driving a car, you’ll need a vehicle pass. One pass costs $25 and is good for seven (7) days. For those who are walking in and taking their bikes or motorcycles, they’ll need to get an individual pass worth $12, also good for seven (7) days. Winter rates are different. Vehicle passes are worth $15 and individual passes are free. There’s also an annual park pass that’s worth $35. If you’re planning on camping, you also have to get a permit which requires a $10 to $23 camping fee per night. This will give you access to the park’s drive-in camping grounds. For hikers and bikers, they share one campsite and need to pay fees of either $5 or $8 pax. Backpacking overnight? You’ll also have to secure a backcountry permit before you travel. Note: If you’re going to Waterton Lakes National Park in Canada, you’re going to pay a separate fee. Want to Avoid the Crowds? The simplest answer to this problem is to stay away from the park during peak season, which is marked from mid-June to the first of May. July has also been pegged as the busiest month all year. The less busy seasons span from late September to October, which is when the colors of fall start to cover the entire park. This also happens to be the best opportunity to see all the larch trees by the west side of the park. The hills also turn bright yellow, fading into orange as October ends. Want to avoid the crowds even at peak season? There’s still a way. You’ll want to look for a trail head that’s of equal distance from to major spots and go for the woods. This method will get you a considerate amount of privacy since most people head towards the hotels. If you need to drive, head to the Going-to-the-Sun Road before 8:30 AM. This will also give you a chance to enjoy the beautiful morning mountain view, as well as the wildlife you’ll otherwise not see later in the day. No matter your strategy for the travel, Glacier National Park is definitely filled with great photo opportunities. Try to catch the mountains in different colors and have your photo taken with the blossoming wildflowers. You’re sure to come home with tons of memorable photos.